We all know very well that on the 1st April 2018, the well-known DNS 1.1.1.1 was launched by Cloudflare promising maximum speed and privacy to all its users. We know that using alternative DNS is the form of the day and from this company, they followed the steps of the tech giant Google and IBM. Somewhat later they launched an app to activate the Cloudflare DNS 1.1.1.1 with a single click, which is available for both the well-known platform, of course, iOS and Android. But, now, they once again return to lead the path by adding its all-new VPN app. On the 1st April 2018, the well-known DNS 1.1.1.1 was launched by Cloudflare promising maximum speed and privacy to all its users. We know that using alternative DNS is the form of the day and from this company, they followed the steps of the tech giant Google and IBM. Somewhat later they launched an app to activate the Cloudflare DNS 1.1.1.1 with a single click, which is available for both the well-known platform, of course, iOS and Android. But, now, they once again return to lead the path by adding its all-new app, Warp, the new VPN of Cloudflare which promises the maximum speed with high security for your privacy. As we all know that we have many DNS alternatives beyond the tech giant Google’s 8.8.8.8. But, the OpenDNS, IBM, and Cloudflare are three of the major companies that stand out in this field and each time has more support from users. Curious thing is that the case of Cloudflare, which has made its DNS 1.1.1.1 as one of the best services which have now become an alternative to take into account. In addition, thanks to its mobile application it is very easy to use which simply allows to change the DNS in Android and in iOS. In case if they lack some reason to convince us, now they celebrate the anniversary of the arrival of DNS 1.1.1.1 with the addition of Warp. Technically, this is a VPN service, although from Cloudflare say they want to go a step further to convince even users who have no idea what is a virtual private network (VPN). Warp will be an option within the Cloudflare DNS 1.1.1.1 app for iOS and Android. If users decide to activate the option, all traffic will be redirected through this secure connection service, in addition to optimizing for the best performance. From Cloudflare, they state that they will not have the means to know where we are browsing or what we are doing on the internet due to the use of end-to-end encryption. In addition, they claim that Warp offers a service capable of compressing the content and help us to consume fewer data along with an increase in speed from the mobile devices. They also confirm that the use of Warp in the mobile devices does not mean an increase in the consumption of the battery and drop of the signal, as the use of this VPN will make it “recover” more quickly. 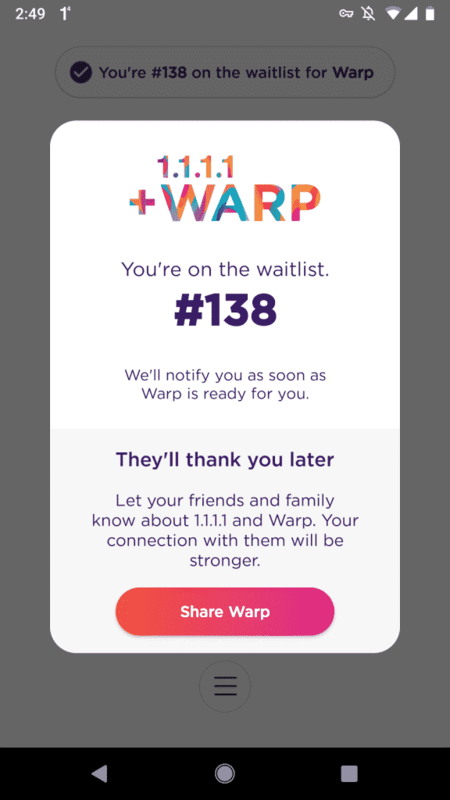 Moreover, the most interesting thing about this new VPN is that it is completely available for free within the Cloudflare app 1.1.1.1, but, at the moment, we can sign up on the waiting list to try the all-new Warp.